WHO: Any student who is 5 years old – 6th grade. 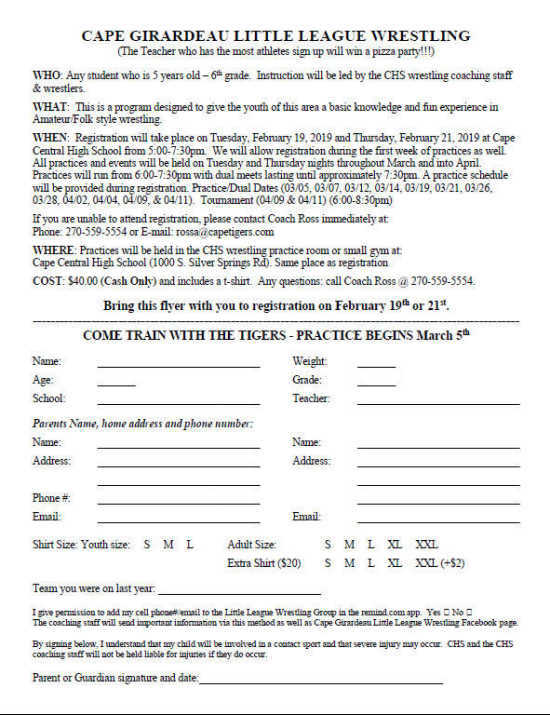 Instruction will be led by the CHS wrestling coaching staff & wrestlers. WHAT: This is a program designed to give the youth of this area a basic knowledge and fun experience in Amateur/Folk style wrestling. WHEN: Registration will take place on Tuesday, February 19, 2019 and Thursday, February 21, 2019 at Cape Central High School from 5:00-7:30 p.m. We will allow registration during the first week of practices as well. All practices and events will be held on Tuesday and Thursday nights throughout March and into April. COST: $40.00 (Cash Only) and includes a t-shirt. Any questions: call Coach Ross @ (270) 559-5554.